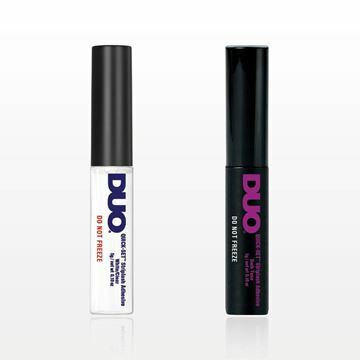 DUO® Eyelash Adhesive is the world's best-selling lash adhesive and has been a favorite of professional makeup artists for decades. This latex-free long lasting formula is intended to keep individual lashes on for 2-4 weeks. USAGE: Pour 2-3 drops of adhesive onto a small piece of foil, and then gently grasp a single lash with tweezers near the knotted end pulling from the tray. Next dip knotted end of lash into adhesive and place lash on top of your natural lash with the knotted end as close to your eyelid as possible. CAUTION: Use only as directed. Keep away from children. Avoid getting into eyes. If contact occurs, wash immediately with lukewarm water. Try using Qosmedix professional lash applicators to apply lashes. *This lash glue is not intended for temporary or full set lashes. 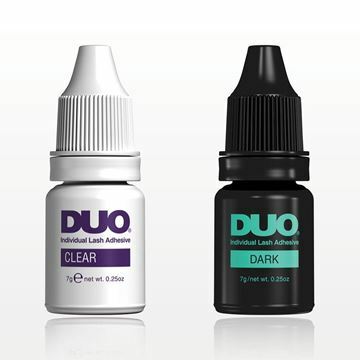 DUO® Eyelash Adhesive is the world's best-selling lash adhesive and has been a favorite of professional makeup artists for decades. This latex-based formula was created for all-day wear with strip lashes and can also be used to apply individual lashes, lasting several hours. Dries Clear. Usage: Check fit of lashes and trim excess if needed. Then apply a thin line of adhesive along band and spread evenly with a disposable applicator. Wait 30 seconds for adhesive to set and place lash as close to your natural lash line as possible. Try using Qosmedix professional lash applicators to apply lashes. Finish by gently pressing along the band to secure in place. CAUTION: Keep away from children. Use only as directed. Avoid getting into eyes. If contact occurs, wash immediately with lukewarm water. 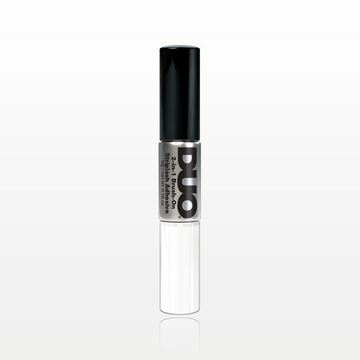 DUO® Eyelash Adhesive is the world's best-selling lash glue and has been a favorite of professional makeup artists for decades. This latex-free adhesive comes with a thin brush for precise and quick application. The formaldehyde-free formula was created for all-day wear with strip lashes and can also be used to apply individual lashes, lasting several hours. Enriched with Vitamins A, C and E and available in both Clear and Black formulas. Usage: Check fit of lashes and trim excess if needed. Then apply a thin line of adhesive along band of lashes. Wait 30 seconds for adhesive to set and place lash as close to your natural lash line as possible. Try using Qosmedix professional lash applicators to apply lashes. Finish by gently pressing along the band to secure in place. CAUTION: Keep away from children. Use only as directed. 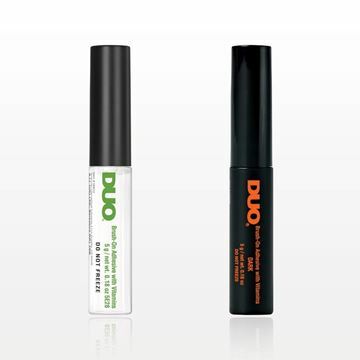 DUO® Eyelash Adhesive is the world's best-selling lash glue and has been a favorite of professional makeup artists for decades. This new, dual-ended design offers both dark and white/clear adhesive. The latex-free, formaldehyde-free, hypoallergenic formula was created for use with strip lashes or individual lashes. Usage: Check fit of lashes and trim excess if needed. Apply a thin line of adhesive along band and spread evenly with a disposable applicator. Wait 30 seconds for adhesive to set and place lash as close to your natural lash line as possible. Finish by gently pressing along the band to secure in place. CAUTION: Keep away from children. Use only as directed. Avoid getting into eyes. If contact occurrs, wash immediately with lukewarm water. 5 grams, 5 ml, 0.18 oz. DUO® QUICK-SET™ Striplash Adhesive sets in seconds! The formaldehyde-free, latex-free formula is water-resistant and comes with a silicone applicator for precise application. Check fit of lashes and trim if needed. Then apply a thin line of adhesive along lash band. Wait a few seconds for adhesive to set and place lash as close to your natural lash line as possible. Finish by gently pressing along the band to secure in place. CAUTION: Keep out of reach of children. External use only. Avoid getting into eyes. If contact occurs, wash immediately with lukewarm water.